Pin-Craft, a long-established company, entered the naval sector towards the end of the '50s. Up until that time, shipyards had been obliged to build everything in-house, from moulds to furnishings to onboard accessories. The articles offered by Pin- Craft (at that time, especially gangplanks, gratings, tables and armchairs) were appreciated by boat builders because their availability speeded up production, enabling builders to concentrate exclusively on building the actual boats. Today, after many years, during which Pin-Craft's products have reached a very high level of quality, the company remains a leader in the supply of accessories for yachts and pleasure boats. 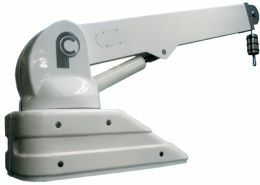 Given the dimensions of the latter, the Pin-Craft 35 GS2 telescopic davit is particularly suitable. It is equipped with hydraulic rotation, lifting, arm extension and lift- cable wrapping. So as to blend in with modern environments, such as the latest yachts, the davit is made entirely of polished, varnished stainless-steel, while the carter at the base is of varnished composite. Suitable for the lifting and moving of particularly large tenders, the arm is 2.20-meter long and extendable to 3.20 m. With respect to the arm's rest position, it can be inclined 55° on the vertical axis, with a movement upwards of the tender's anchor point of 2.54 m (with arm totally extended), a technical solution that facilitates lifting the tender above the handrails or stainless- steel guards that are usually installed around upper- deck sea terraces. The 35 GS2 davit's maximum capacity is 400 kg with arm extended and it has an overall weight of 350 kg. To facilitate installation onboard yachts where the use of 12-V current is not provided for, the system can also be powered by a 24-V source. For further information, contact Pin-Craft - Fabbrica Accessori Nautici, Via M. Coppino 377, 55049 Viareggio; Tel. : 0584 383930; Fax: 0584 395848; Website: www.pin-craft.com ; E-mail: info@pin-craft.com .